John Berggruen Gallery is pleased to present an exhibition of new paintings by California-based artist Clare Kirkconnell. The exhibition – the first of the gallery’s 45th year in business – opens Thursday, January 8th, and continues through Saturday, January 31st. John Berggruen Gallery will host a reception for the artist on Thursday, January 8th from 5:30 to 7:30pm to coincide with the San Francisco Art Dealers Association’s First Thursdays. This is Kirkconnell’s third solo show at John Berggruen Gallery. In this exhibition of fourteen new paintings, Kirkconnell continues to communicate her vested interest in nature through her selection of organic subject-matter and through her process, which mimics the elemental unpredictability intrinsic to the natural world. She mixes her paint directly on the canvas, allowing the pigments to pool and mix freely. Despite the surrender to entropy this process entails, Kirkconnell relies heavily on a grid to structure her compositions. 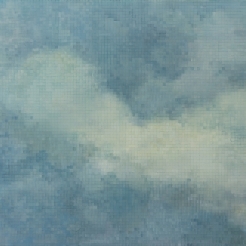 Although it is a recurring theme in her paintings, the grid takes center stage in the new works exhibited in Juxtapositions. The prominent position the grid assumes in her works is rooted in her early experience with and exposure to the fiber arts. Kirkconnell’s grandmother taught the artist to knit and weave, and thereby introduced her to the grid, at a very early age. From then on, it became a powerful informant behind her creative impulse. “Graph paper was a constant tool from early on,” Kirkconnell has acknowledged, explaining that “the warp and weft of those clean blue lines inspired [her] to create much more readily than a blank sheet of paper.” The impulse, however, is not to treat each of the small squares comprising the grid as distinct, solid, matte blocks. Unlike graph paper, stained glass, and screen pixels, each of Kirkconnell’s subcomponents borrows from the next. Each square blends into its neighbors, harboring unique graduations of hue and tone that create an alluring visual display by freeing the pure, unmodified grid of its inherent rigidity and severity. Kirkconnell is also interested in investigating how colors interact with each other, and the overall effect these interactions produce. Driven by a budding interest in color theory, she has researched at length the work of French chemist Michel Eugene Chevreul, whose color principle – namely that the perception of a given color can change depending on the colors surrounding it – greatly advanced art in Europe in the eighteenth century. Kirkconnell employs the grid as a playground upon which to explore this theory in her art. The combinations of earthy tones used in this latest body of work make the canvases subtly shift and pulsate, morphing as if alive, sometimes in entirely unexpected ways. Born in Brownsville, Texas, in 1955, Clare Kirkconnell spent a number of years in Mexico City before returning to Houston to finish high school. She developed an interest in the arts early on and continued her education at Palomar College in San Marcos, California. After college, Kirkconnell spent several years as a fashion model traveling the world from bases in New York and Paris. She concurrently studied acting, landing several film and television roles, including a three-year run as the female lead in the highly acclaimed drama The Paper Chase. Never abandoning her early interest in painting, Kirkconnell then continued her studies at Santa Monica College and Otis Parsons School of Design. Her work has been consistently well-received and can be found in many important private collections. When not in the studio, Kirkconnell divides her time between her husband and son, the family wine business, "Hollywood and Vine Cellars," and a deep, abiding urge to see every corner of the globe.